The Automatic Millionaire is a system that doesn’t require motivation. It won’t require you to keep the energy going to be rich. It won’t require you to have discipline. It won’t even require you to have a budget! Traditional wealth building programs tell you that you’ve got to have a budget, you need to have discipline, you need to be motivated and you need to write out your goals. The Automatic Millionaire teaches that those things ultimately fail when you’re trying to be wealthy. The truth is, you’re too busy to spend all day thinking of wealth building. 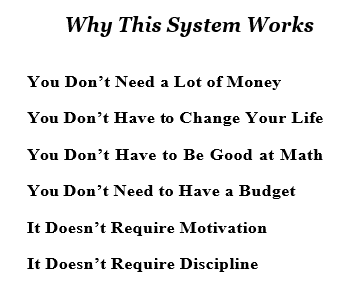 You need a system that will work while you sleep–a system that is automated. The American Dream is not necessarily a million dollars. The American Dream is having the freedom to do what you want to do when you want to do it. The idea behind the American Dream is freedom. But you need to have money to have that freedom. You can have a really big income and make a whole lot of money and still not have freedom. Making more money won’t make you rich unless you do something with that money for yourself. The Automatic Millionaire is not about getting rich overnight. You don’t get rich in days; you get rich in decades by creating a system that makes it so that you literally can’t fail. It’s not how much you earn that determines whether or not you’ll be rich. It’s how much you spend. You have more money than you think—RIGHT NOW. This is a core concept. Chances are, in your day you have money that is leaking out of your pocket. This is money you have that could be getting you rich. Track your expenses for a whole month, include everything. Then, ask yourself honestly, is there anything that you spent money on that was something you could cut back on? As our income goes up, our spending goes up. You can’t positively think your way to wealth, You have to positively do your way to wealth. Take a look at how quickly this Latte factor can add up! Now let’s say you were able to get your Latte factor up to $10.00. How quickly can $10 add up? Do the Latte Factor math! Why would you wake up in the morning, leave your family, not do what you want to do with your day, go to work all day long for 8, 9, 10 hours a day, commute back home, get up and do it all over again? Why would you do this 5 days a week, 4 weeks out of the month, 12 months out of the year? Why would you do all that to earn money and not pay yourself first? Most people pay everyone else before themselves: the government, their creditors, and their bill collectors. Everybody else gets paid first and then if anything’s left over, then they pay themselves. The first hour of every day that you work should be going to you. What you need to do is pay yourself first automatically. See, if you take the money automatically out of your paycheck and pay yourself first, then you are living on what’s left over and you won’t need a budget. The average American saves less than 22 minutes a week of their income. Putting it another way, the average American saves less than 2% of their income. Now again, why would you work all week long and not have some of the time in your day go to you? Don’t “pay yourself first” anything. Spend everything you make, no matter how much money you make. “Pay yourself first” 5 to 10% of your gross income. “Pay yourself first” 10 to 15% of your gross income. “Pay yourself first” 15 to 20% of your gross income. All fundamental wealth begins by paying yourself first. Making your financial life automatic is one of the core principles of this program. If you miss it, this program will still help you, but it won’t help you as fast. The government figured out how to get you to automatically pay them first. Corporate America has figured out how to get you to automatically pay them first. Why in the world wouldn’t you use the exact same technology that they’re using to pay yourself first before you pay them? The technology is not difficult to use. What do you need? You need a phone and a pen. There’s only one legal way for you to get out of those taxes. The only legal way for you to get out of those taxes is to pay yourself first using a pre-tax retirement account. What’s a pre-tax retirement account? That includes the following. The average American family reportedly has less than one month of expenses in savings. What would you do if you lost your job, got injured, or were otherwise unable to bring in any money? You need to have an “emergency basket” of reserve funds that you can easily access in case of emergency. HOW MUCH SHOULD YOU PUT ASIDE IN THIS EMERGENCY BASKET? Ideally, you’ll have six months of expenses set aside separate from your checking account in case of emergency. At a minimum, you should have at least 2% of your income going directly into your emergency basket of cash. How much you have in this emergency basket is up to you and your comfort level. Some people are comfortable with one month’s expenses; others need as much as 24 months. Once you decide how much you’re going to save, it’s time to make it automatic. WHAT IF I HAVE DEBT? HOW MUCH SHOULD I BE SAVING? Get one month of emergency money in savings. Then you can start focusing on paying down your debt. Even if you’ve got credit card debt, get a month expenses in your security account. Don’t stop paying your credit cards but don’t lose sleep over the fact that you’re not paying off your debt. Get a month of expenses put aside, then start tackling your credit card debt. A key component of what we’re doing today is the “sleep well at night” factor. Now what is that? It’s really very simple. What keeps you up at night? One thing that keeps people up at night is worrying about money. It’s really important to completely put that aside. The way you put that aside, the way you’re able to get a good night’s rest is to have an emergency basket of cash. Money worries are pervasive, and your emergency basket of cash can be better than any sleeping aid on the market today. The likelihood of your being rich as a renter is virtually zero. Statistically, renters in America do not become millionaires. The average renter in America has a net worth of less than $4,000. Homeowners, on the other hand, have an average net worth of $140,000. One of the first things you should be saving for, one of the most important purchases that you can make is – not stocks, not mutual funds – buy a home. People’s homes are actually often their greatest asset and the greatest amount of equity that they have when they retire. Here are six reasons why homes make great investments. One: It’s forced savings. When you buy a home, you’re forced to pay that mortgage. You will figure out a way to pay for it. Most people find out that over time the greatest form of financial security they have is the equity that they’ve built up in their home. Two: The second thing is leverage. The power of real estate is truly about the power of leverage. You’re using a little bit of money to get a lot more assets. Three: The third reason homes make great investments, is that you’re using OPM, or other people’s money. Five: The pride of ownership. Six: Real estate has proven to be a great investment. The National Association of Realtors states that since 1968 when they first started keeping national records of real estate, real estate investments as a whole have had an annualized return of 6.3%. What does bi-weekly mean? Here is a very simple example. Say you spend $2,000 a month right now on your mortgage. If you took your mortgage, instead of paying for it once a month like everybody does, you spent $1,000 on your mortgage every two weeks you know what would happen? You’d take a 30-year mortgage and you’d pay it off, depending on the interest rate, in less than 22 years! • It saves you thousands of dollars on your interest payments. • It’s a forced way to save additional dollars. • It makes your cash flow easier because you’re now paying for your mortgage when you get paid. • It cuts years off your mortgage. What is tithing? The key behind tithing is the idea that a piece of what you sow you give back. In other words, as your income comes in you give some of your income back to the world to help it. That can be your church, your temple, your community, whatever your source of spiritual inspiration. You’re helping people in need. Give anywhere from 1% to 10% of your income away while still saving.